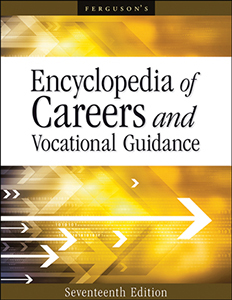 Encyclopedia of Careers and Vocational Guidance—now in its 17th edition—remains the most comprehensive career reference in print. This unparalleled resource has been expanded to six volumes and fully revised to contain the most accurate and current career information available. In Six Volumes and Thousands of Pages of Information! The six-volume Encyclopedia of Careers and Vocational Guidance, 17th Edition is an essential resource for public, college, high school, and junior high school libraries; career centers; guidance offices; and other agencies involved with career exploration and planning. Each article has been thoroughly revised and updated, and many new articles have been added. Comprehensive career information, sidebars, and user-friendly features, including the Career Ladder, which shows common career paths for each profession, provide a clear picture of what it takes to launch a successful career. Called out by graphic icons are the top fastest-growing careers, the highest-paying jobs, and the top careers that experts predict will add the greatest number of positions. More than 7,000 websites are listed in the career field and profession articles and refer users to professional associations, government agencies, and other organizations. More than 1,000 sidebars ranging from profiles of industry movers and shakers to glossaries of industry jargon to fast-fact industry statistics are also included. Designed to hold students' attention and relay information effectively, this edition of Encyclopedia of Careers and Vocational Guidance is the ideal starting place for career research. Appendixes of information and resources for finding apprenticeships and internships and for people with disabilities. Volume 1 contains two major sections, Career Guidance and Career Fields and Industries, as well as appendixes and indexes. You're Hired—features information on salary and wages, fringe benefits, personnel management, employment laws, and employees' rights. One hundred and forty career field and industry articles provide in-depth information on alternative energy, consulting, education, engineering, health care, Internet services and security, nanotechnology, social media, telecommunications, and much more. Each article includes an overview of the field or industry and sections covering the background, structure, and outlook of each one plus additional resources for further investigation. Volume 1 also includes two appendixes—Career Resources and Associations for Individuals with Disabilities and Internships, Apprenticeships, and Training Programs—and four indexes. Career articles are indexed by two government classification systems: the Canadian National Occupational Classification System and the O*NET-SOC. The Organization and Website Index provides an alphabetical listing of all the organizations and agencies found at the end of each career article. The Job Title Index, found in all six volumes, makes it easy to refer from one volume to another. Volumes 2 to 6 contain more than 980 career articles, listed from A to Z. For More Information—presents a list of helpful organizations that can provide further information. Black-and-white photographs. Indexes. Appendixes. In six volumes. "...provides a treasure trove of insight...a complete career reference center...a significant source of contemporary information in easy-to-understand language. This important resource is necessary for professionals who help youth make complex education-to-work choices and will be useful for university career centers, counseling centers, public libraries, secondary schools, guidance counselors, and job seekers. Highly recommended."